Integrated Training Company (ITC), was launched in 2001 with clear and concise goals that will assist in qualifying and developing the Saudi Arabia’s nationals so they can play a vital role in various industries. Offering hundreds of training courses, it has helped thousands of local trainees to graduate, who are today happily and gainfully employed, circulating their earnings into the local economy. Part of the Abdullah I Al Subeaei and Sons Group that was founded in 1933 and listed as one of the biggest 100 companies in Saudi Arabia, ITC represents the parent company’s eagerness to support and participate in the national approach to qualifying and developing workforce. The continuous successes ITC achieved so far has created a great deal of enthusiasm and eagerness to grow further and serve wider range of satisfied customers, says the company. • Industrial programmes and utilities engineering – over 150 courses: The top list is – Advanced Maintenance Planning, scheduling, auditing and benchmarking; Advanced Valve Technology (design, selection, installation, applications, inspection, maintenance and troubleshooting); Associate Value Specialist (AVS) certification; Centrifugal Gas Compressor (operation, control, startup, shutdown, maintenance and troubleshooting); compressor and steam turbine; control valves; corrosion and materials; Diesel Engine (construction, operation and maintenance); effective maintenance management; electrical and mechanical maintenance planning and scheduling; fundamentals of engineering exam prep course; gas turbine operation and maintenance and protection; HVAC System (humidity, ventilation and air conditioning); IADC Wellcap Well Control Work over/Completion – well servicing supervisory level; industrial water treatment; maintenance planning and scheduling; mechanical seals; metallurgy for the non-metallurgist; pressure safety relief valves – operation, maintenance and inspection; programmable logic control; pumps and compressors operations, trouble shooting and maintenance; selection of materials for refineries and petrochemical plants; steam trap construction, installation and maintenance; steam turbine technology and maintenance – advance technology; stock control and materials management; value engineering; vibration analysis and mechanical inspection; vibration monitoring, analysis and balancing. • Services and construction – 20 courses: The top five are – Pre-Aramco exam – scaffolding supervisor and inspector course; rigging and slinging; scaffolding erector, inspector and supervisor; forklift safety operations and scaffolding safety awareness. • Banking – 13 courses: Business and management – over 150 courses; finance and accounting – over 75 courses; human resources – over 50 courses; information technology – over 40 courses; procurement, logistics and transportation – over 40 courses; project management (mainly PMP/PMI certification) – 20 courses; quality and auditing – over 50 courses; sales and marketing – over 40 courses and soft skills – over 50 courses. 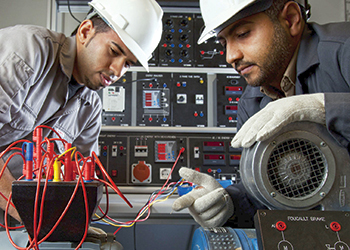 III) On the other hand, ITC, has gained its customers’ trust and become Saudi Aramco’s Contractor Workforce Qualification Assurance Programme (CWQAP) accredited centre for training and qualifying Saudi Aramco Contractors’ technicians on many skills such as (machinist, electricians, instruments and safety). IV) Another important training wing of ITC is to support the Saudi market through Long Training programmes that end with employment for young Saudi generation accredited by HRDF. These ITC programmes are full of excitement for the targeted Saudi youth resulting in high graduation percentage that have reached sometimes 80 per cent.